We were talking to a friend about radish recipes and she swore up and down that the only way to eat radishes was raw, crunchy and fresh. There was no other option to eating radishes, raw was it, she declared. She’s a great gardener, cook and mom. Her dedication to family, food and a healthy lifestyle is admirable. We wish we could be like her when we grow up. But she’s wrong. We don’t often argue about food, knowing that everyone has their own tastes and preferences, however we had to disagree with her about radishes. Yes, she’s very wrong in making such an absolute statement and we can’t wait to show her why. First of all, she’s right about eating enjoying radishes when they’re fresh. It’s hard to beat a freshly picked radish fresh, especially when it’s from the garden. Raw radishes in this state are so crisp and full of fresh, peppery flavor. In fact, almost every produce has it’s glory when eaten raw. We’ve got radishes growing everywhere in the garden and we often can’t keep up with how fast they grow, so we’re enjoying radishes straight from the soil and they’re wonderful. Now that we got that agreement out of the way (she reads our blog), we think there’s another option for a great radish recipe. Roasting the radishes in the oven, along with the tender greens and a little bit of olive oil is a fabulous alternative. 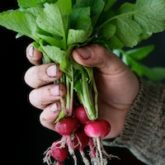 We would normally never think of roasting the radishes either, but when our garden is exploding with baskets of radishes, we have to come up with some different options for radish recipes. 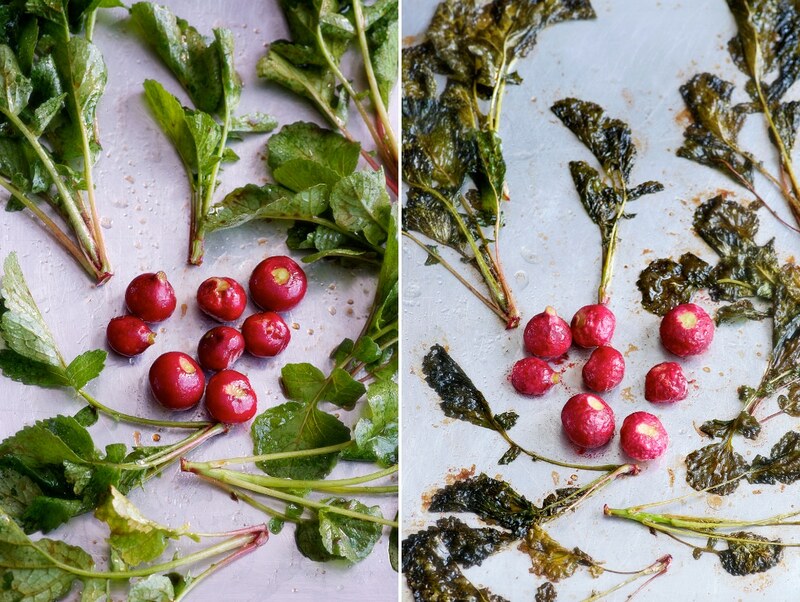 These roasted radishes and their greens come out of the oven wilted, gorgeous and delicious. Granted, roasting radishes loses their crunchy texture and peppery bite, but they’re still fabulous along side their savory roasted greens and round flavors of balsamic vinegar. What you have after a few quick minutes of roasted love is a satisfying bowl of roasted veggies that taste almost like roasted turnips. 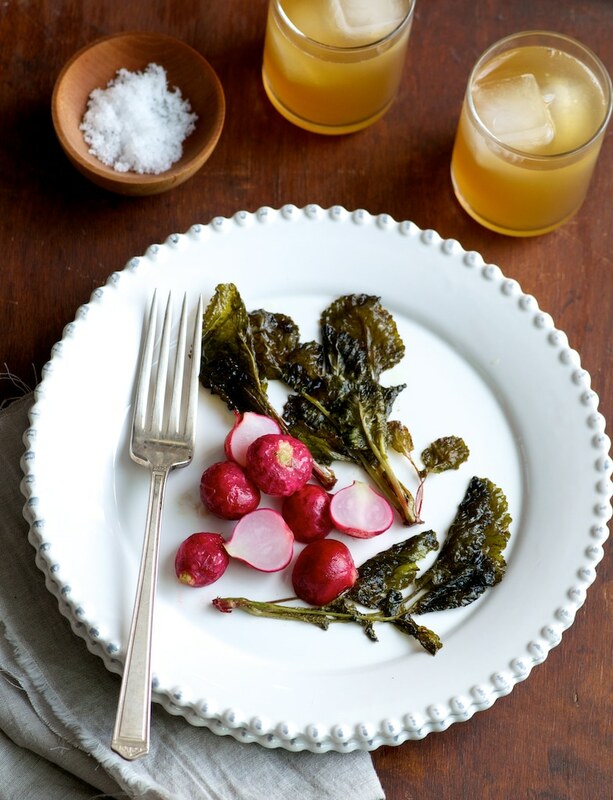 An added bonus is the delightful, delicate crispness of the radish greens when roasted. That was one factor which surprised us on how delicious it turned out. They have just enough thickness that they can crisp up without disintegrating, becoming a beautiful fan carrying the balsamic vinegar’s delicate sweetness into your mouth. Dear Michelle, so there you have it, our argument for roasted radishes and greens. Thanks for engaging us in this friendly food fight. I think we all win on this one! Take that!…stupid radishes… im also growing swish chard,shyer snap peas,and carrots next spring. And a herb garden. 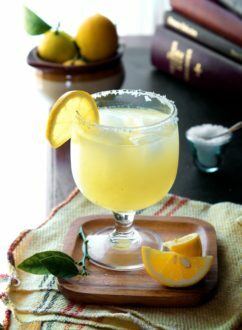 I’m late to the party, but wanted to thank you for such a great idea — and such a straightforward recipe. My 2nd grader made radishes for his class on Earth Day (he did a presentation on the benefits of local/seasonal eating). It went over very well! My aunt was at my house last week, and we were searching for ways to use the radishes I got from my local CSA. We came upon this post and I decided to try roasting them. The radishes were fine, but it was the oven-roasted greens that blew me away. I had no idea they could be this amazing. THANKS! Mate & I signed up to a CSA for the first time this Spring and we picked up our first bushel today. In it, among other tasty things, was a HUGE bunch or locally grown radishes. Seeing how beautiful the tops were, I thought there *had* to be a way to keep them from going to waste. Mate asked me if I could try deviating from the usual “radishes in the salad” method of serving radishes by Google-ing for a hot radish recipe. You, dear bloggers, have solved 2 challenges for me; and I thank you. Fresh, roasted, or pickled all good. Even braised can be good. I’ve been waiting for some radishes so I could roast them. I’m not used to eat raw radish alone unless they’re combined with a salad. I’m anticipating for radishes after this post. 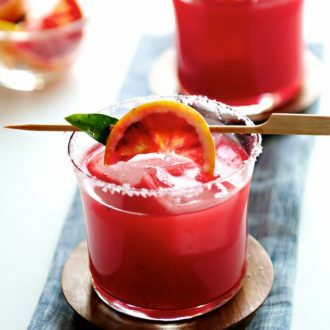 Oh yes, they’ll be right up your alley 🙂 And, makes a pretty pic – I can just imagine what you could do with it – gorgeous! LOVELY! We eat a lot of raw radishes swiped through cold butter, dipped in a little salt, but I love them roasted. What a gorgeous post, including the greens, thank you. Stephanie- swiping the radishes in cold butter sounds like a real treat. Must try! I love roasted anything, I’ll try this recipe soon. I have only eaten radishes raw too. I adore salads made with radish greens; however, I have never tried roasting the greens (following the basic principle of : If it works this way, why change it?). Unlike your friend though I am open to the idea! tasteofbeirut- great that you’re open to the idea because roasting them is awesome. I’ve never had roasted radishes before, but you’ve convinced me that it too has its merits, same as fresh ones. Manggy- YES!!! Pickled. Been there. Done that. YUMMY. Now this has me thinking, what else can we do with radishes. I like them in sandwiches with butter, but aside from roasting, which is marvelous, are there any other ways to make radishes? Angela- we’re sure there are many options and ideas out there. Probably the best is to google “radish recipes” and see what cool recipes you can find! I would have never thought to roast radishes (or their greens!) but I am trying this as soon as I spot some in the market! This reminds me that I need to harvest the radishes in our garden, too. We also have some beets that need to come out. I love how the radishes look in your photo! I have to say that I am a raw, crunshy, fresh radish kind of girl. The idea of cooking them always seemed silly to me since I’m not sure how it could make them any better, but I think you’ve convinved me to give it a shot. Of course, since it’s still pretty darn cold up here in New England, it’ll be a while before my garden gets going and I can actually pop some radishes in the oven. Katie- like we said, the roasted radishes taste like roasted turnips. If you like the texture and flavor of roasted turnip, this will be for you! 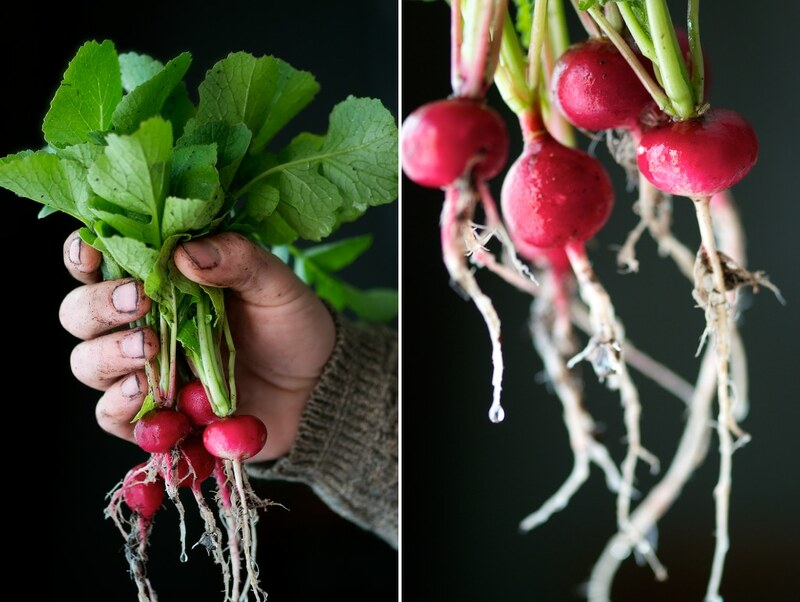 Love roasted radishes (and fresh too) and especially love the shot of the gardening hand clutching them – perfect! When I tried roasted radishes, I was so pleased with how they were different than the fresh, crunchy ones. Loved them! I’ll have to wait until the farmer’s market starts up again to get them with fresh greens. 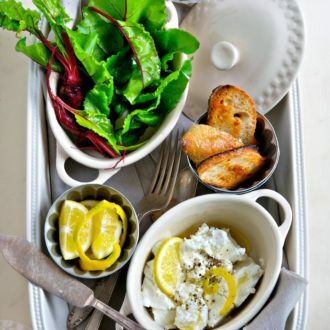 This looks like a great way to eat radishes! I’ll admit that the only way I have ever eaten radishes is raw- usually in salads. I just bought some radishes yesterday and I am very tempted to give this a try for my lunch today. Thanks for expanding my radish-eating options! I like them roasted. 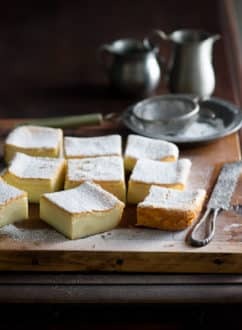 I also steam them and serve with melted butter and salt flakes. I never thought to roast the green tops. Sounds interesting. 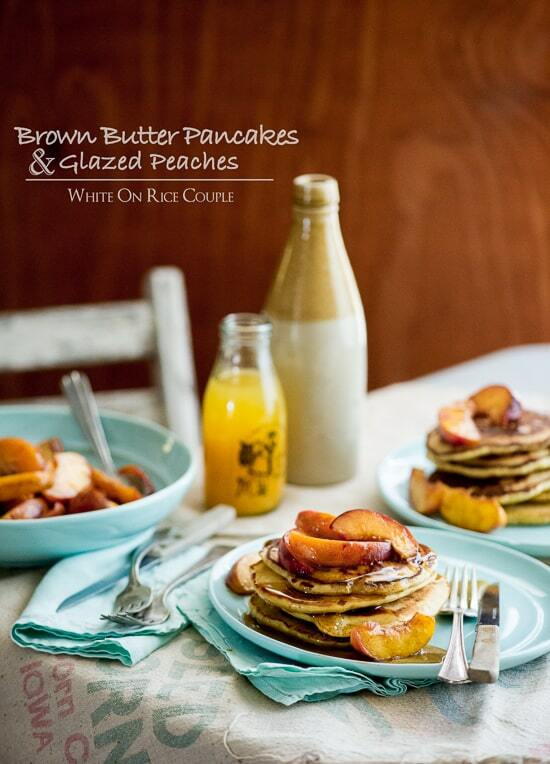 Barbara- oooh, steaming them sounds wonderful and added butter makes it more amazing! I’ve been roasting them this year, too! All the California rain made every little seed germinate, leaving me with so many that I had to figure out something to do with all of them. Roasting radishes is an excellent variation. Delicious too. The trick I have found is to watch how long they roast; they can easily turn into mush. I may have to side with Michelle on this one though; my favorite way to eat them is raw too. I’m with you on radish roasting! The key is not to think of them as radishes. Once they’re roasted, they’re another root vegetable — a creamy, tasty one with a nice reddish tinge. Sometimes I get too excited about radishes and buy too many. After that first day of crunchiness, there is a little wilting that happens and, other than a thin slicing a drizzle of olive oil and red wine vinegar for a perfect salad to go with sardines, I’m going to say THIS is the go to recipe. Roasting brings out the best in radishes and would make a perfect side for a rustic meat or fish course. Great idea. Love the argument and the stance you took! I will be trying this in the near future! It never crossed my mind to roast radishes, but these do look great! We love them on salads or just by themselves on a veggie tray.